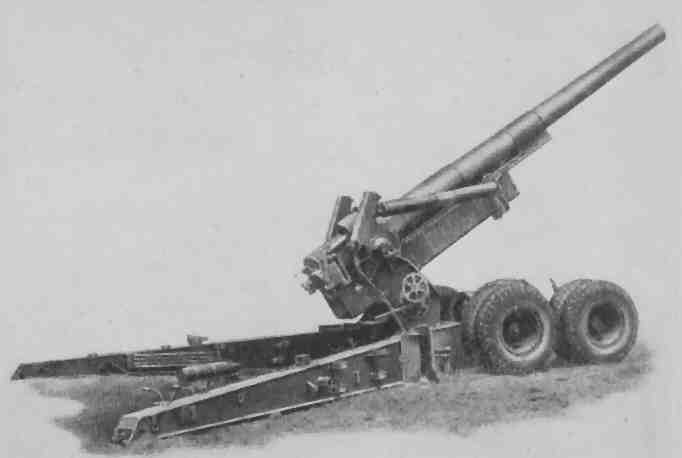 The 7.2-inch Howitzer was derived from the WW1 8-inch Howitzer, which had insufficient range. Various shell weights and calibres of 7 and 7.4-inch were initially considered, 7.2-inch was selected in November 1940 and the design approved in April 1941. The different 7.2-inch ordnance Mks were various lined down 8-inch barrel Mks, a new build monobloc barrel was initially developed but lining down was adopted because it was cheaper. The carriage was that of the 8-inch How/6-inch Gun modified with modern sights, pneumatic tyred wheels and brakes for vehicle towing (the WW1 original had been towed by Holt tractors). Barrel Mk 1 was monobloc, Mks 2 - 4 were lined down 8-inch barrels Mks 6 - 8. A distinctive feature of the Mk 1 carriage was the use of large scotches behind the wheels and smaller ones in front, these were essential when firing charge 4. 7.2-inch equipped heavy batteries from mid 1942. In Burma they were provided as a 'pool' of 2 guns per corps and usually operated by HAA or medium regiments as required. During WW2 7.2-inch was only used by RA regiments, including those of Newfoundland. Regiments using these guns are listed here and here. Mks 1 - 4 went out of service at the end of WW2 but Mk 6 (see below) equipped post-war heavy regiments and remained in British service until the early 1960s and in Indian service for several years after that. In 1943 heavy regiments reorganised to have 2 batteries of 7.2-inch howitzers and 2 of US 155-mm guns M1. This led to the adoption of the M1 carriage for 7.2-inch, a possibility that had been idenified in 1942. Mk 5 was the existing ordnance modified for the M1 carriage and does not seem to have entered service. Mk 6 was a new, longer barrel, for use with the M1 carriage and introduced in early 1945. This barrel was monobloc construction. The existing charges 1 - 4 were retained with a new charge 5 added, the significantly larger chamber resulted in lower MVs despite the barrel being longer than Mks 1 - 5. Mks 5 and 6 did not have calibrating sights. UK had sought 155mm carriages from the US in 1943-4 but US production delays meant they did not become available until 1944. 26/Manuals/3062 HE, Mk 2D, double band, streamlined, 1942. 26/Manuals/12096 HE, Low and high angle, 1957. 26/GS Pubs/1056 BL 7.2-inch Howitzer Mk 1 - 4 on Mk 1 Travelling Carriage, 1943. WO Code 8426 BL 7.2-in Howitzer Mk 6 on Carriage 155mm/8-inch M1, 1949. WO Code 9408 BL 7.2-in Howitzer Mk 6 and BL US 155mm Gun M1 & M1A1 on Carriage 155mm/8-inch M1, 1956. 26/Manuals/3039 Ordnance BL 7.2-in Howitzer Mk 1, 1*, 2, 3 and 4 on Carriage 7.2-inch Howitzer Mk 1, 1942. 26/Manuals/4314 BL 7.2-in Howitzer Mks 5 or 6 on Carriage 155mm/7.2-inch Mk 1 and 1S, 1944. 26/Manuals/3233 Ordnance BL 7.2-in Howitzer Mks 1, 1*, 2, 3 & 4 on Carriage 7.2-inch Howitzer Mk 1, 1943. 26/Manuals/3516 Ordnance BL 7.2-in Howitzer Mks 5, 5*, 6 & 6/1 on Carriage 155mm/8-inch M1, 1945. 57/Guns/2484 BL 7.2-inch Mk 1 Howitzer on Mk 1 Carriage, 1942. WO Code 1896 Ordnance BL 7.2-in Howitzer Mks 6 & 6/1 on Carriage 155mm/8-inch M1 and Limber Heavy Carriage M2 & M5, 1945.